Vedantu.com - No.1 online tutoring company in India provides you Free PDF download of NCERT Solutions for Class 11 Biology Chapter 6 - Anatomy of Flowering Plants solved by Expert Teachers as per NCERT (CBSE) Book guidelines. 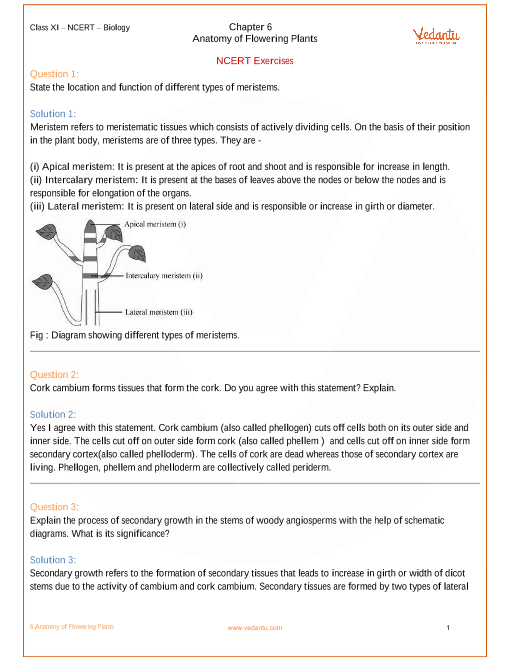 All Chapter 6 - Anatomy of Flowering Plants Exercise Questions with Solutions to help you to revise complete Syllabus and Score More marks. Register for online coaching for AIPMT(NEET), Engineering and Medical entrance exams. NCERT Grade 11 Biology Chapter 6, Anatomy of Flowering Plants is from Unit 2, Structural Organisation in Plants and Animals. To study the internal structure of an organism, one finds several similarities as well as differences. This chapter introduces you to the internal structure and functional organisation of higher plants. In this chapter, The Tissues, Meristematic Tissues, Permanent Tissues, The Tissue System, Epidermal Tissue System, The Ground Tissue System, The Vascular Tissue System, Anatomy of Dicotyledonous And Monocotyledonous Plants, Dicotyledonous Root, Monocotyledonous Root, Dicotyledonous Stem, Monocotyledonous Stem, Dorsiventral (Dicotyledonous) Leaf, Isobilateral (Monocotyledonous) Leaf, Secondary Growth, Vascular Cambium, Cork Cambium and Secondary Growth in Roots will be studied with the help of flow-charts, diagrams and figures. Anatomically, a plant is made of different kinds of tissues. The plant tissues are broadly classified into meristematic and permanent. Assimilation of food and its storage, transportation of water, minerals and photosynthates, and mechanical support are the main functions of tissues. The study of these tissues, their composition, functions and types shall be learnt in detail in this chapter. NCERT Grade 11 Biology Chapter 6, Anatomy of Flowering Plants is from Unit 2, Structural Organisation in Plants and Animals. Unit 2 is a combination of 3 chapters and holds a weightage of 5% in the NEET examination and a weightage of 12 marks in the final examination. Get 100 percent accurate NCERT Solutions for Class 11 Biology Chapter 6 (Anatomy of Flowering Plants) solved by expert Biology teachers. We provide solutions for questions given in Class 11 Biology text-book as per CBSE Board guidelines from the latest NCERT book for Class 11 Biology. The topics and sub-topics in Chapter 6 Anatomy of Flowering Plants are given below. EX 6.4.3 - Secondary Growth in Roots. Chapter 6 Exercises - 12 Questions with Solutions. Other than given exercises, you should also practice all the solved examples given in the book to clear your concepts on Anatomy of Flowering Plants. Download the free PDF of Chapter 6 Anatomy of Flowering Plants and take the print out to keep it handy for your exam preparation.